Don’t let the picture fool you; there are plenty of seats and space to dangle out of this spot – Ved Stranden 10. With the shelves loaded with organic, natural and bio wines, it’s your own fault if you come out of here without a buzz. The picture does give you a feeling of the atmosphere in here though (I hope). It’s very low-key, though it is located in a bit of an upper-class area in Copenhagen with lots of big businesses around. Even though some of the “wall-street guys” are sitting with wines in their glasses, there are all sorts of people here. Tourists sitting outside in the days of sunshine, local business guys, couples, friends and wine nerds. 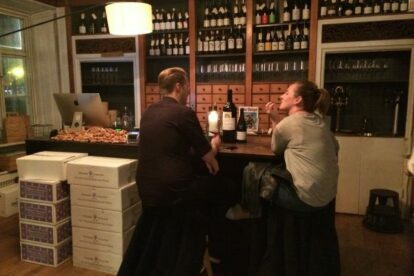 In my opinion it’s one of the best wine bars in city center. Besides having natural / biodynamic wines, which I love, I think it’s because of the good service here. I always have a good chat with the waiters and they are always in the mood to challenge you with some new and exciting products. They have tastings on Wednesday from 17:00. Haven’t tried it myself, but I think it’s worth the visit and taste. Every Monday they are serving “Staff Food”, which they describe as a meal to share in good portions with good friends. First in, first served!